CMU Men's Basketball: Season Preview | Grand Central Magazine | Your Campus. Your Story. Central Michigan University’s men’s basketball team is the favorite to win the Mid-American Conference for the 2015-16 season, as named by media members. After a tough 89-79 loss to the Buffalo Bulls in the MAC tournament title game last season, CMU had to settle for a six-seed in the National Invitation Tournament rather than NCAA tournament play. CMU played three-seed Louisiana Tech first in the NIT, falling to the Bulldogs 79-89. The Chippewas earned a seed in the NIT by winning the regular season title in the MAC. Meanwhile, the Bulls earned a bid to the NCAA tournament for winning the conference tournament. CMU ended the 2014-15 season with a record of 23-9, 12-6 in conference play. At the end of the season, head coach Keno Davis won three different awards: MAC coach of the year, National Association of Basketball Coaches District 14 coach of the year and 2015 Skip Professor of the year, which are awards given to the coaches who achieve success on and off the court. Davis also received a 5-year contract extension with the Chippewa’s worth $300,000 along with $100,000 for radio and television appearances. The players getting ready to lace it up for their four game home stretch to begin the season, starting Nov. 13 against Jacksonville State. The team acquired three freshmen this past off-season: Hunter Hale from Kalamazoo, Janeau Joubert from Belleville and Corey Redman from Boyne City – all guards. As a senior at Boyne City High School, Redman averaged 17.9 points per game and 5.9 rebounds per game. These players will look to make their impact during their first season in maroon and gold. However, our teams list of returning players outweighs the list of newly acquired players. Returning guards include: Captain Chris Fowler, Rayshawn Simmons, Braylon Rayson and forward John Simons – all of which started in all 32 games for the team last season. Rayson made a huge impact last season as a younger player on the team, breaking the record for single season free throw percentage – .894 – at CMU and went perfect in 14 of 32 games. When the season concluded, he was one of three Chippewas to average double figures. Rayson will look to carry on with his superb play from last season. 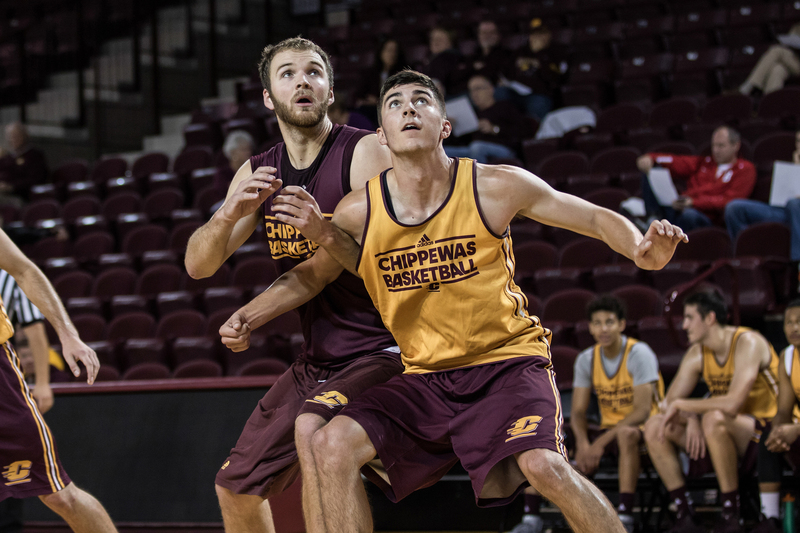 Fowler, who led CMU on the court, as well as in multiple statistical categories last season, is returning for his senior year at CMU. He earned many awards at the end of the season, the biggest being the Boyden Award, which honors athletes who are an exemplary example of CMU. Fowler had an outstanding season last year in the NCAA and made a huge impact, ending the season by becoming the all-time assist leader at CMU and earning 194 assists, which boosted him to a 533 overall. Fowler also led the team in scoring, minutes played, and scored double figures in 16 of 32 games played. Senior John Simons will continue to make his mark beyond the 3-point arc as well as in the paint. Last season he had a 3-point percentage of .404, he ranked second on the team in scoring with 12.3 ppg and 36 steals. Simons also scored double figures in 20 games last season. Fowler and Simons will start the season with their 95 consecutive career start as Chippewas. CMU will work to surpass their one game knock out last season in the NIT tournament. Their first game is against Jacksonville State on Friday, Nov. 13. The following two are against Alma on Nov. 17 and Webber State on Nov. 23. Separator image Posted in Food & Wellness and tagged with Chris Fowler, CMU Basketball, John Simons, Rich Drummond, sports, Will Bly.